One key issue facing horse owners today is the loss of open space for trail riding. In Massachusetts, 16,000 acres of open space are lost to residential and commercial development every year. New home construction blocks existing trail access because developers are either unaware of existing trail systems or because the new land owners prohibit anyone on their property for fear of liability issues. What can be done? Here are a few simple suggestions. Become involved with your town boards. If your state or county does not already have a trail committee, form one. Contact your local land trust, if one exists, and work with them on land conservation issues. Make friends with local developers and make them aware of existing trail systems. In many instances, developers present two types of plans to the town. One is a flexible development plan and the other is a conventional plan. A flexible development can provide conservation, open space and most importantly, trail access. In other instances, a conventional plan is chosen due to the terrain, septic requirements and access to public properties. An active trail committee provides feedback to the town planning board similar to the way engineers, conservation and highway departments provide comments for consideration. Similarly, the trail committee can work with the local land trust to provide input on trail access and potential recreational use across land trust and conservation properties. It is most beneficial to work together with other user groups – bikers, hikers, and snowmobilers. Working together and finding mutual goals has proven to be a win-win situation for everyone. The Essex County Trail Association (ECTA) which covers the towns of Hamilton, Wenham, Topsfield, Essex and Ipswich has done an outstanding job organizing and coordinating projects to keep trails cleared and monitored, and to close off trails in vulnerable areas during early spring. Landowners are invited to make maintenance requests through the area representatives or directly to the Board. ECTA works to promote goodwill and serves as liaison between landowners and trail users. They keep informed of potential sales and building activities, which might threaten the use of critical trails; and they work to preserve vital links. They urge new owners to keep existing paths open (or try to relocate them) so that trail networks are maintained without interfering with the owner’s prerogative to build where he/she pleases on his/her land. Know your state’s equine liability laws. To address the liability issues, provide landowners a copy of your state’s equine liability law and landowner liability laws. Under Massachusetts’ law, an equine professional is not liable for an injury to, or the death of, a participant in equine activities resulting from the inherent risks of equine activities (pursuant to section 2D of chapter 128). The landowner liability law basically states that if you do not charge a fee and do not commit willful, wanton or reckless conduct, the landowner shall not be liable for personal injuries or property damages sustained by members of the public using the land. If a landowner does agree to let you use the trails on their property after you give them a copy of these laws, make sure you offer to keep the trails open and maintained to the best of your ability. It also does not hurt to offer them a small gift of compensation every year to thank them for their hospitality. Do not ever take landowner generosity for granted! Be aware of soil erosion problems. This is a big concern of environmentalists. 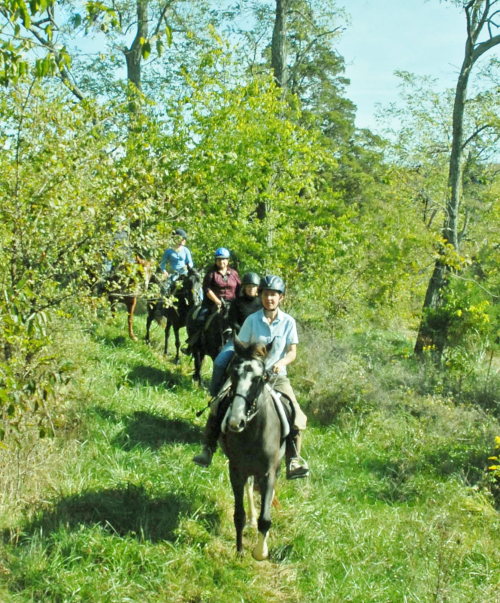 You can be prevented from riding trails because of the fear of soil/trail erosion that horses cause. Some claim horses cause more soil erosion than hikers. Others claim bikers cause more erosion than horses. There are plenty of studies to support each and every claim. However, poor trail layout and lack of maintenance cause soil and trail erosion than any other cause. The solution? Offer the option of mitigation instead of closing the trails altogether. Ask for assistance from landscape architects, engineers, or natural resource managers on how to repair or prevent erosion from starting. Partner with land-owning agencies. Get involved with your local land management agencies, whether it is the town, state or local land trust. Be aware, they make policy that can preclude you from riding or driving on particular properties. Pay attention! Policy changes can stem from things like conflict, intimidation or erosion problems. Don’t be left out of the loop. Equine interests must be involved to present their side and promote their interests. Find out who uses the trails. Keep the lines of communication open. Know which groups and trail users are on the trails on a regular basis. Trails have to be maintained to serve the needs of all users (not just the horse community). All user groups need to work in unison for the same common goals. It is good to establish a written agreement between all users establishing who agrees to do what, when, and each particular group’s contribution. Share with and Respect other Trail Users. If we want t to continue to ride on the limited amount of land that is available, we must learn to share. This is where trail etiquette and education come into play. Working together creates a common goal and bond and reduces conflict. Conflicts scare land managers into shutting down trails altogether rather than dealing with conflicts that can be frustrating and unpleasant. Use your Trails. Under use of any trail can contribute to its demise. This almost happened in Mt. Grace State Forest in Warwick, Ma. Part of the Around the Mountain Trail disappeared into obscurity because of under use. A committed group of users were successful, however, in restoring the old trail and reconnecting it to a loop of trails that are enjoyed today by the Boy Scouts, mountain bikers, snowmobilers and horse lovers. A total of 220.5 hours were put in to complete this restoration project. Get involved. Speak up, show up and get to know who else is involved. Know your local town conservation commission, open space committee, town recreation/trails committee and town or regional land trust. Find out if they are amenable to horseback riders. If not, become a member and an active participant. Join your local riding club and get involved in trail work. Make a connection with statewide organizations and understand the issues. Help out on volunteer trail maintenance projects. Educate yourself on the issues/laws/concerns in your particular state and county. Equine liability laws, landowner liability laws and erosion/pathogen issues are good starting points. Develop a strong and active communications network with other equine groups and other trail user groups. Horseback riders cannot afford to ride in their own little world thinking that things will always be hunky-dory. That is not the real world. We as horseback riders have to get involved and stay involved. The benefits are numerous, not just for us, but for the entire equestrian community impact that it brings.